Here at Project Alicia you will find photography of all kinds, but what is dearest to my heart is and will always be the simple, understated moments captured within the walls of my home. The unplanned, unstaged, tender moments that tug at my mommy heartstrings. So, when I was contacted by Rebecca Cooper to review her latest eBook, Real. Life. Photography, I jumped at the opportunity. You may know Rebecca from Simple as That, a blog chock-full of beautiful photos, printables and crafty inspiration galore. She is an author of two previously published photography eBooks, 40 Top Tips for Better Photos and Don't Say Cheese! But Rebecca is not only a professional photographer, author, scrapper and talented blogger, she is also a mother of four adorable children. Much like Rebecca, I'm on a mission to capture life's simple, fleeting moments. 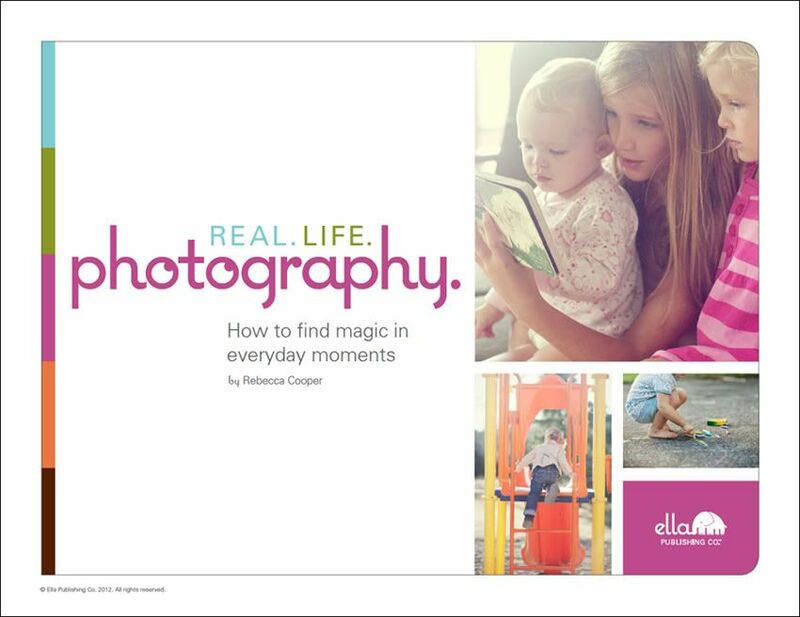 But whether you are a professional photographer, novice or mom... you'll love this book. Rebecca outlines easy to understand ways to find magic in the everyday. 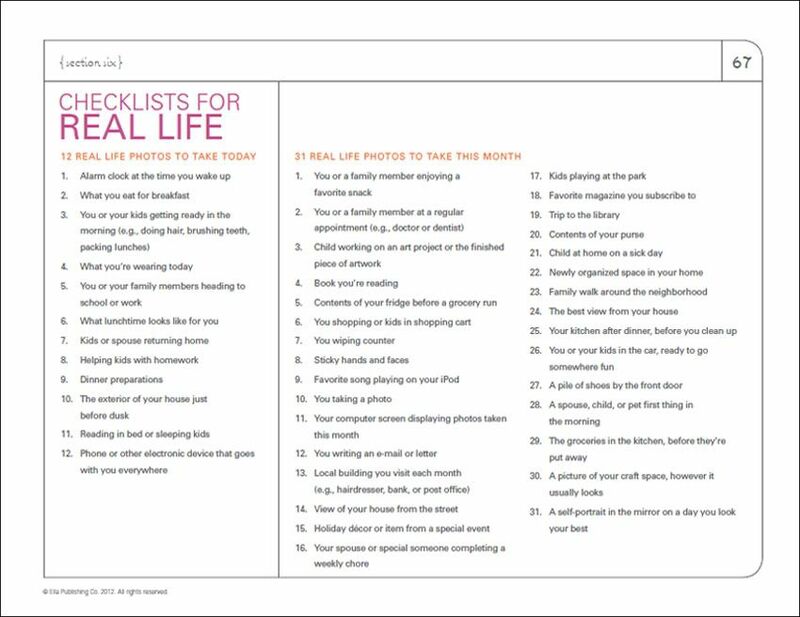 The book is 70 pages long, organized into 6 chapters and includes "Checklists for Real Life" in the last chapter- daily, monthly, and yearly. But if you've been following Rebecca, you already know that her lists never disappoint! You can find them all here. 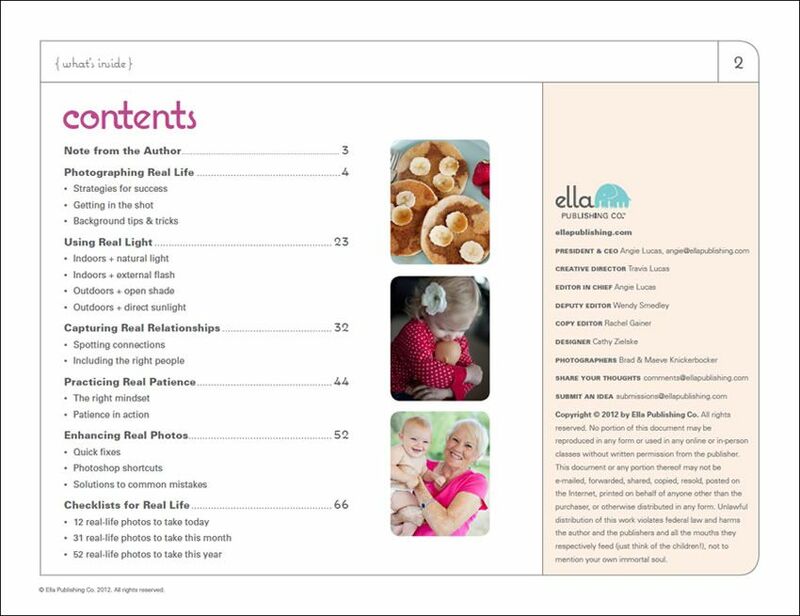 Lists are a wonderful way to help photographers think outside the box and be inspired. These lists can be especially helpful for everyday photos. By using Rebecca's lists and fabulous tips in Real. Life. Photography, you are going to be more prepared to capture those endearing moments that might otherwise be missed. She Says, "Photographing real life isn’t always easy. In fact, it’s a lot harder than taking family portraits in a well-lit studio or outdoors at the perfect time of day. Real life passes quickly. It doesn’t wait for you to pull out your camera. It doesn’t wait for ideal lighting conditions. And it doesn’t wait for your house to be spotless. But I promise that capturing everyday moments is worth the extra effort. Capturing life as it happens helps me see things differently. Boring becomes beautiful. Ordinary becomes extraordinary. Life can get so busy and crowded with distractions that it’s easy to forget what matters most. Pausing to take photos along the way helps me slow down and just enjoy my life exactly as it is." 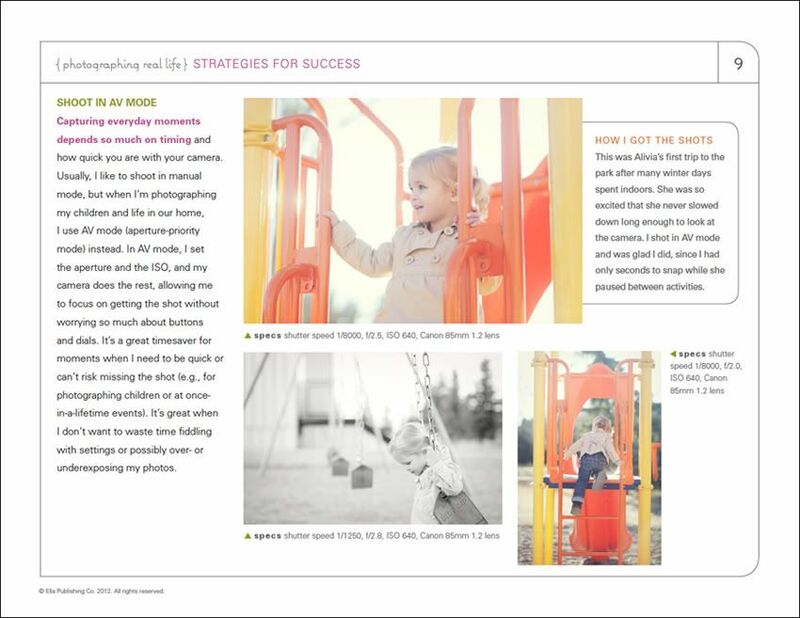 Throughout the book she shares how she got her shots as well as camera settings, wonderful tips and tricks and of course beautiful photography! 127 beautiful images to be exact. She even touches on photo editing, with step by step photo examples using various photoshop tools. 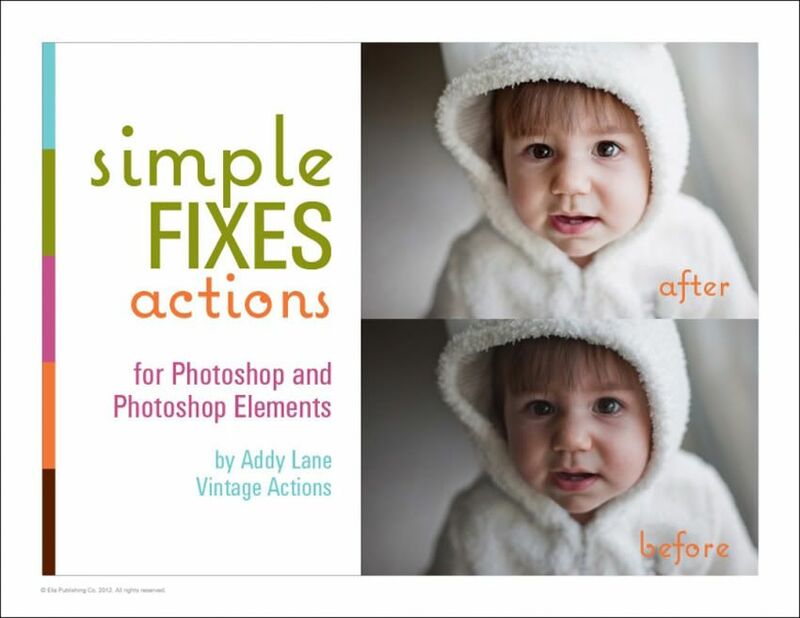 And as an added bonus, Christy from Addy Lane created a set of Simple Fixes Actions that are a perfect companion to Rebecca's new eBook. The actions are easy to use, work with both Photoshop and Photoshop Elements, and transform any photo into something extra special with a soft, understated vintage-like finish. You can learn more about these Actions by Addy Lane here. I love Rebecca and her new eBook. Her work is truly inspirational. It has certainly inspired me to pick up my camera and think about my photos differently. Rebecca has generously offered one of my Project Alicia readers a copy of Real. Life. Photography. as well as a set of Addy Lane's Simple Fixes Actions. To enter: Just leave a comment telling me your favorite thing to photograph. For an extra entry: "LIKE" Project Alicia & Simple As That on Facebook (and leave a comment letting me know). Giveaway will run until Friday, 6/29 at midnight. I will announce the winner on 6/30. Or if you purchase both the book and the actions together, you can receive 20% off using the promo code PHOTOFIX at checkout through June 30th. Make sure to stop by Rebecca's place for a chance at some fabulous prizes as well! Thank you, Rebecca, for giving me this opportunity. I'm flattered to be included in the launch of your fabulous new book! *Disclosure: Thank you to Simple as That and Addy Lane for sponsoring my post and for providing me with this wonderful eBook and action set. I genuinely love the work of Rebecca and Christy. All opinions are mine. My children are my favorite thing to photograph! My favorite thing to photograph is my family. Until my mother passed away last year I never realized just exactly has precious life is and especially to cherish each and every moment with my family. I'm eager to learn how to capture those precious moments of my family so years down the road we can be in the 'moment' with each and every photo. I'm so sorry for your loss... but what a great reminder. Thanks for sharing your story. My favourite thing to photograph is any kind of landscape - usually including water or trees - on a sunny day. My favorite thing to photograph is details, whether it be in people, architecture, or nature. I also like capturing the everyday moments of real life but I'm learning how to do that. This ebook looks really helpful. Thanks for the review. I'm excited to look around your blog too. I love to photograph just about everything but flowers seem to be my absolute favorite. everyday moments and candid shots. I love taking photos of my girls! I love taking photos of the everyday details. That might change next week when well have a new puppy joining the family who will be my new photography model no doubt!! I've also just liked both Facebook pages - I look forward to your updates! Wow - I love the sound of this book, hope it's open internationally ;-) But if I don't win I'll be purchasing for sure! I love to photograph just about everything, but my fave is my daughter and my cats. Thanks for the chance to win! Already "like" you on fb and just "liked" Simple as That. I like Project Alicia & Simple As That on Facebook. I love to photograph nature and landscapes shots. Also people when they're not looking. I like to capture the moment. Ahh my favorite photographic subject? Nature. Hands down. My favorite thing to capture is children interacting with pets - the moment they forgot you were there. I love when they look like their lost in their own little world. Thank you for a lovely giveaway. My neighbor just got a new camera, her first DSRL and is having a baby next week. Cannot think of a better gift for her ! I like you already and I am sharing this post on facebook for you. I love taking photos of my niece! I like Project Alicia & Simple As That on Facebook! So far I like to take pictures of almost anything, within reason. I love to see the beauty of all things. Earlier this week we had to move our RV because the ants were literally marching in. I thought about taking a picture of them, but as quick as we pulled the RV up a few feet, they were gone. I love to take pictures of my three beautiful kids, and almost anything in nature! Flowers are one of my favorite subject, they are usually pretty cooperative. The 13 year old is another favorite, but she's often not nearly as cooperative. I've recently got back into photography. I'm enjoying the digital format along with the editing capabilities over film. I am really interested about being able to capture peoples emotions and make stunning portraites. These books will be a great help in that area. My favorite thing to photograph is my kids, but it is getting more difficult as they grow older and are constantly running away - to friends, to activities, to private time. It goes by so fast!! I like Project Alicia and Simple as That on Facebook. Myself...Ha....I'm totally kidding. I love to photograph my 2 boys and babies. I love to photograph our family. Our family moves a lot, and home is definitely wherever we are all together! I love to photograph the people I love! I love to photograph anything outdoors! I love to photography my children. My daughter's eyes, are my favorite thing to photograph. Her deep dark eyes seem to look directly in my soul. I love taking pictures of my boys playing together.